Epsom salt, or magnesium sulfate, is a well-known compound that has been used across the world for hundreds of years to soothe aching joints, relieve skin conditions, and provide peace and restfulness. This chemical compound is made up of magnesium, sulfur, and oxygen, and though it is similar in appearance to whole table salt, is not as notorious for internal use, and is not composed of sodium chloride. Epsom salt’s high magnesium content makes it an excellent choice for those wishing to supplement the body’s natural production of this mineral. Since the beneficial magnesium is released when Epsom salt is dissolved in hot water, it is most commonly used in baths or foot soaks. Many advocates of this remedy claim that hot baths allow the magnesium to be absorbed into the skin; however, there is little research available to prove the veracity of these assertions, and most of the evidence is purely anecdotal. More research is being conducted into the benefits and science behind Epsom salt soaks, though, and it is becoming increasingly popular in mainstream circles. Epsom salt relieves stress by relaxing tight muscles and easing inflammation. This stress relaxation then spreads throughout your body and brings you to a better state of mind, allowing for clearer cognitive ability. Rather than directly treating the infection, Epsom salts are known to draw out the infection and help make the skin less susceptible to further issues while softening skin to make medication more effective. Please note that it is still important to take any medications prescribed by your doctor, and if you suspect some sort of fungal infection, you should make an appointment as soon as possible. Many people fail to give their feet the care they deserve. If you live in a dry environment, or experience painful cracked heels in the wintertime, due to overdrying, you should consider the exfoliating power of Epsom salts. Pair an Epsom salt soak with foot scraping and extra moisturization for the full benefits. If you frequently wear sandals, you may have to switch to closed toed shoes and socks for a while to give your feet time to repair cracks. The anecdotal evidence claiming that Epsom salts improve magnesium levels in the body has not been backed by hard research. However, it is has been proven that magnesium may help encourage deep sleep by producing melatonin. Regardless, soaking your feet in a warm water bath gives you time to unwind, clear your mind, and relax from a hectic day. Making it more likely that you will fall asleep quicker and sleep more deeply. If your job demands that you spend a lot of time on your feet, especially in shoes such as high heels, it is unlikely that your feet are very happy with you. Soaking your sore feet in Epsom salts can decrease inflammation, remove the buildup of toxins, and decrease muscle cramping. Foot soaks of any kind serve to clean and deodorize your feet. Proper hygiene goes a long way in removing the stench from sweaty feet. Be sure to keep shoes clean and dry and try to find footwear that breathes to allow moisture buildup to escape. Stubborn splinters can cause significant pain and swelling around the affected area. Soaking feet in warm water and Epsom salts can soften skin and pull out pus, loosening the splinter and making for easier removal. This method can also be beneficial for splinters in hands or fingers. Taking the time to relax and soak your tired, sore feet in a warm tub of Epsom salts not only brings physical relief but can also restore you to a healthy mental state by bringing peace and relaxation. The health of your feet is worth a little extra effort, don’t you think? Fill a small container, big enough to fit both your feet up to your ankles, with hot water to cover your feet and ½ cup of Epsom salt. Give the Epsom salt a few minutes to dissolve and then check the temperature of the water with your finger to ensure that it is not going to burn your feet. Slip overtaxed feet into the Epsom salt soak and relax for 30-45 minutes. Read a book, listen to music, meditate, or do something else that soothes and calms your mind. Try adding a few drops of your favorite essential oil to the soak to bring added benefits. Lavender essential oil: Add for increased relaxation effects, concentration, and better sleep. This is most effective when used right before bed. Peppermint essential oil: Add to increase alertness, improve digestion, and relieve a headache. Eucalyptus essential oil: Add to enhance antimicrobial effects of Epsom salt, soothe cold symptoms, and boost mental ability. Citrus essential oil: Add to boost your mood and encourage germ elimination. Tea tree essential oil: Add to calm redness and help with reducing inflammation. After you are done soaking your feet, take a handful of Epsom salts and gently rub them over your heels and the hard parts of your feet for extra exfoliation. Rinse feet with cool water and dry thoroughly, then put on lotion and socks to enhance moisturization. Repeat this process at least two times a week to see results. Try to avoid daily use as this can actually produce adverse effects by drying out your feet and encouraging cracking. Epsom salts can actually be used in the kitchen to help scrub stuck on food off of pots and pans. Simply add a handful to whatever you are washing, and the coarseness will dislodge caked on food without scratching pans. Mixing equal parts baby oil and Epsom salts in a bottle creates an excellent moisturizing and exfoliating handwash that also disinfects and cleans grimy hands. Try adding an essential oil for a scent boost. The exfoliating powers of Epsom salt do not stop at the feet. Following a bath or shower, when your skin is still wet, rub the crystals over any areas of your body that suffer from dry skin. It is particularly beneficial on knees, elbows, hands, and feet. It is unwise to use Epsom Salts to treat chronic foot pain without consulting your doctor. If you have continued or unexplained pain, sores, or blisters, stop use immediately and schedule an appointment with your podiatrist or general care physician. Exposure to Epsom salt topically is unlikely to produce any side-effects and is generally considered safe when used appropriately. 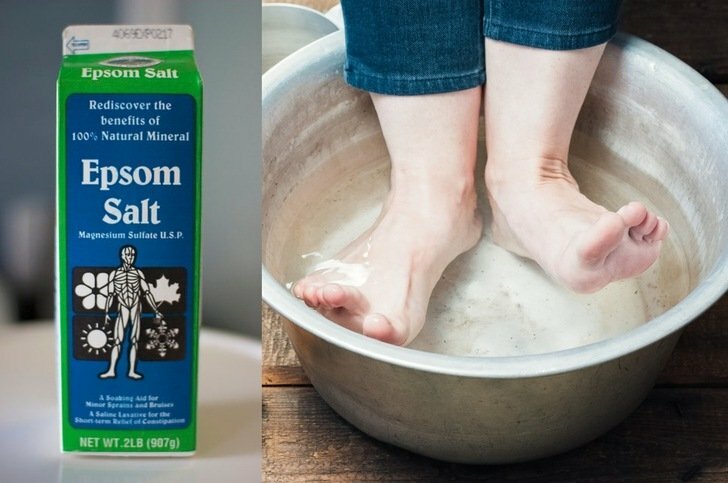 Epsom salt can be an excellent choice for those wishing to give their feet a little extra love. Taking the time to look after your feet and treat yourself to a few minutes of quiet time can have a therapeutic effect on your entire body. If you don’t already have an Epsom salt stash, take a trip to the drugstore today or purchase some online to invest in your hardworking feet.